I've had this rug for a few years and it still looks beautiful! I move a lot so it's been an entry rug, an office rug and now it's in my kitchen. It has stood up to a lot of foot traffic and countless vacuuming. I love it so much I'll never get rid of it! Mesmerize your guests with this eye-catching wool rug. Featuring a swirling geometric pattern in warm hues, this round area rug makes a stunning addition to a grand foyer or the center of a living room or dining room. The soft hand-tufted pile creates a plush feel on your floor, and the modern design makes this piece an instant focal point to anchor your decor. All rug sizes are approximate. Due to the difference of monitor colors, some rug colors may vary slightly. O.co tries to represent all rug colors accurately. Please refer to the text above for a description of the colors shown in the photo. My manfriend and I had been struggling for months to find a round rug for our living room. After trolling hopelessly through countless furniture and rug stores and searching the old super web for hours on end, we were beyond thrilled when we found this rug. Although we both were a touch nervous about the spectrum of colors (thought it may look cheesy and be too much), we could not be any happier with the quality and overall look and feel of the rug. Not only does the rug compliment just about every color we have going on in the room but it has also encouraged us to add a few more colors into the mix. Also, just about every person who walks into the living room loves the rug. One thing, the rug does shed quite a bit when you first get it. Not a major problem as it hasn't lost any of its plushness, but it does require a good vacuuming on somewhat of a regular basis in the beginning. Well worth a little extra pushing around of the vacuum every now and again because this rug is sure to add that needed pop to any living area. This rug is quite beautiful but there are details you should know about. The colors are a bit more defined so make sure you read about ALL the colors incorporated into this rug. In the photo you see more terracotta colors but know that there is quite a bit of the sage and black not well reflected in the photo. The carpet is perfect for my room and nicer than I anticipated. CAUTION: As with all new rugs I vacuumed it with a Hoover Windtunnel and went through 3 sweeper bags. This rug shed so many fibers that the fibers were actually backed up into the hose of the sweeper. This could be from the manufacturing process but didn't take away from the quality of the product. Just received this rug in 6 foot size. Loved it so much, ordered the 4 foot size for the other end of same room. That will be delivered today. If you need a rug with multi-colors this is great. Looks exactly like the picture. I was going to order homedecorators brushstrokes but the direction of pattern was wrong and overstock's prices are half. I also purchased the zebra rug and this, also, was half price. Rugs are wool and I have no problem with "pilling". I do feel in future I'll use this rug for a winter rug and maybe get a white one for summer. My couches and lounges are burgundy leather and I'm keeping 3 walls white but will do one wall a drab olive. If you want to add a rug that will pick up any accent colors you decide to use and/or change with seasons, a rug like this one is perfect. It has deep burgundy shading to light, and deep rust shading to light yellow and deep olive shading to light pale olive. There's a touch of gray. For my color scheme this is really nice. I think they even have an 8 foot circle if you have the room. I wanted my rug to not have any furniture on top so mine is stand alone in center of room. Not much more I can say - dog likes to curl up on it also. First visitor just said Wow. Found the colour and design we wanted after much searching but in 6ft size.Used the online live-help system, and she found it in 8ft diam too... so did the deal on the spot.It was delivered within a week to ENGLAND!! !Looks great as a centre piece to our octagonal lounge.Really pleased with it. I wasn't sure about ordering a rug on line. But this rug has exceeded my expectations. The swirl pattern is just right to soften the room. The mutltitude of colors will work in any room. The thickness of the rug is very good. After vacuuming it several times (you need to do this for wool rugs), the fuzzy look disappears and you are left with this wonderful swirling colorful area rug. 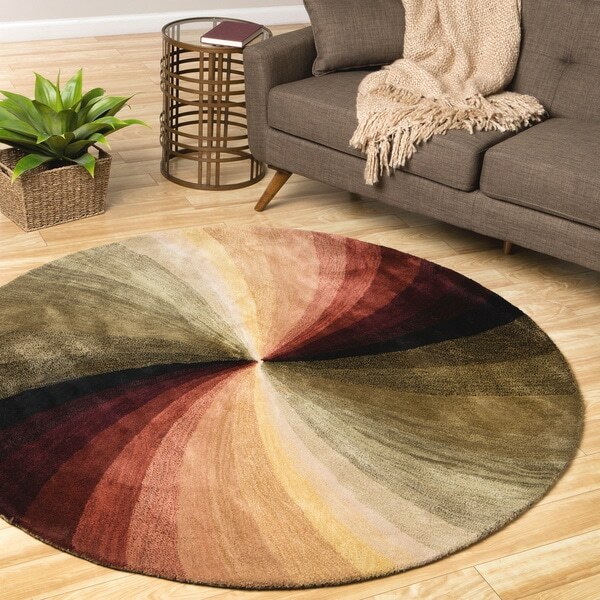 I really like this rug because it has lots of colors from bold to warm colors. This rug helped me to decorate my living room, which is most of these colors. The colors and style of this rug are reminiscent of the 1970's, an era that tugs at our heartstrings, and so we expected this rug to live up to our expectations of bringing back some nostalgia yet being practical, which it does in spades. The colors (especially the red and green colors closest to the black swirl) are slightly darker than pictured, but that doesn't really alter the overall look of the rug. When we first unrolled the rug, it did have a slightly chemical smell to it, and the edges curled up a bit, but we just turned it upside down for a few days, and both the curls and the smell dissipated. There is also a small amount of shedding after first being installed, but a good vacuuming took care of that problem in an instant. In conclusion, we'd buy this rug again, and again, and again, but we don't really need 4 of them, so we just stuck with one. But feel comfortable to buy as many as you want or need as they are worth it! I had a difficult time finding a rug that I really liked to fit underneath my kitchen table. After doing a lot of researching, I came across this rug and thought it was just perfect. The rug matched almost exactly the colors of my other two rugs that are by the sink and entrance door. I was extremely pleased with the fast service and delivery of the rug, but when I unwrapped the rug, the colors are not even close to the one that I believed that I was ordering. The rug that was sent has more shades of green and burgundy, and only two swirls of yellow, unlike the photo that has gold, brown and burgundy. The colors in the rug are not as vibrant as well. Fortunately, the rug still looks great in my kitchen and still pretty closely matches the other two rugs. Overall, I am pleased with my purchase, but if you plan on ordering this rug, you might not be getting the rug that you think you ordered. I couldn't be more pleased with our new hand-tufted swirl area rug. The colors are vibrant and the quality is excellent. From the time I ordered the rug to delivery was less than one week. This was my first purchase thru Overstock.com and I have already ordered additional items. This was definitely a positive experience! Very well made and adds a fun twist to the room. The black in the picture is shades of green. Didn't look like it does on the screen. Also, it felt cheap. I returned it with no hassle. I am glad I bought this rug. The colors are vibrant. There are so many colors in this rug it will go with may things. It has pulled my open concept area together. I have struggled with finding a rug that will go with it, other than solid, and I just saw that there is a 4ft size too which I think I will order. I have vacuumed it once or twice and haven't noticed much shedding. I wouldn't have noticed it all if I wasn't alerted of it by the reviews. I am glad I didn't change my mind as a result of the shedding reviews. My vacuum is a year old and works pretty well too. My cat loves it. I took a chance buying this round rug and am happy with the results. It brightens up my living room. The rug itself is thick. Colors as described. Shipping was easy. I am more than satisfied. Nice looking. "Plush" Attractive in small room. The rug is beautiful. When vacuumed a great deal of the wool ends up in the tank, and the lint shows up on the darker colors, but I love it! Awesome rug but overpriced. Loved it until the cats destroyed it. I get a lot of compliments on this rug. The only bad thing is it sheds and collects lint very easily. Wouldn't recommend for high traffic areas. I love this rug and have had many compliments on it.It goes with all my furniture. I would certainly recommend it to anyone. Have had for years, holds up great, thick, great quality. Absolutely love these rugs. The are very easy to vacuum. I can use them in just about every room in my house. There is nothing that I dislike about these rugs. I would truly recommend them to friends and family. "Does this rug come in a rug runner for the hall?" The design in this round rug would not lend itself to a runner. I can't picture this rug as a runner. "Is this rug still available in the 7'9" round?" "By "6 foot round" do you mean circumference or diameter please?" It's 6 feet in diameter. Yes. It is 6' circumference. It is a beautiful rug but the colors are not as vibrant as they are in the picture. More subdued but still a very pretty rug. "Is there a swirl option in blue or jewel tones?" unfortunately no, it's as you see it. But it's a beautiful piece. "Is this available in 10x10"
"Hi there does this rug come in 31/2 x41/2 or 4x5"
This rug is not available in either size. It is available in a 4' x 6' under ITEM# 12384409. "Is there a coordinating rug in a rectangle"
This rug is offered in several sizes. Please see ITEM#: 10572324 (5'x8'), and ITEM#: 13188213 (12' x 15').